Electricity systems are increasingly becoming interactive and dynamic, opening up opportunities for energy technologies to “talk” to each other and create numerous benefits for energy consumers (e.g., increased efficiency, lower costs, and reduced emissions). This opportunity is one that GPI and our partners are exploring through the combination of electric vehicles (EVs) and solar energy. 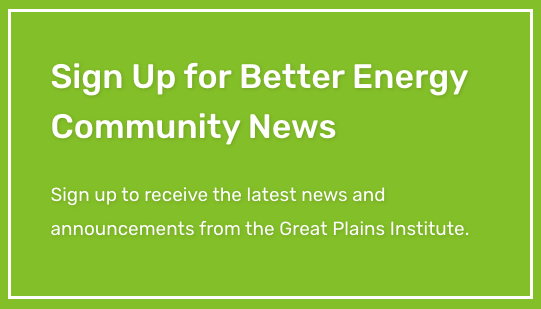 In June 2017, the Great Plains Institute (GPI) in collaboration with ZEF Energy, the Minnesota Pollution Control Agency, and Wellington Management completed installation of three “smart chargers” for EVs at GPI’s headquarters in the Greenway Building in Minneapolis, MN. Instead of pulling energy from the electric grid in a traditional fashion (i.e., in one direction), these smart chargers interact with the grid and the building’s rooftop solar panels to draw more energy to power up EVs (equivalent to a Level 2 charger) while the sun is shining and less energy (similar to a Level 1 charger) when it isn’t. These smart chargers also serve as a pilot for GPI’s newly-funded project through the National Renewable Energy Lab (NREL) to learn how electric vehicles and solar energy can work together to benefit the electric grid. The project is part of NREL’s Solar Energy Innovation Network effort, which selected and funded nine teams across the country to participate. Using this project as a backbone, GPI and its partners plan to take this knowledge and adapt it to a wider variety of situations where controlled charging can be matched with renewable energy production. Let’s take a quick look at how this smart EV charging system works and how the charger output is monitored and varied. Each EV charger has a controller integrated into the stock hardware by ZEF Energy. There are also two solar PV systems being tracked: one on the Greenway roof and one on an off-site location at the Macalester College campus in St. Paul, MN. 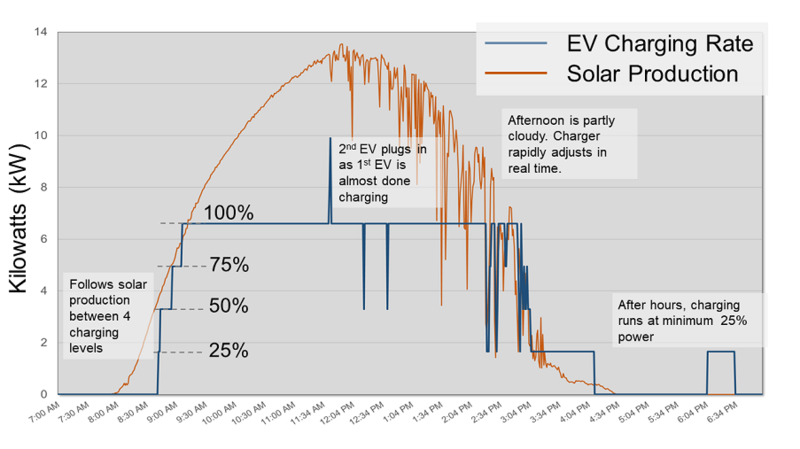 These components are all tied together through a software link, which tells the EV chargers to vary their output based on the aggregated solar generation data. By varying EV charger load based on both on- and off-site solar PV generation, we can show how these types of systems could be deployed across a wide range of use cases. 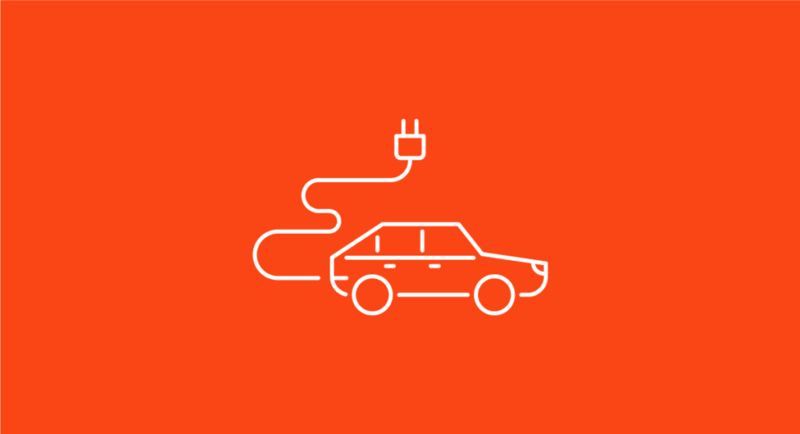 Examples include residential applications that combine solar and wind energy charging, using solar to charge fleet EV vehicles, and the opportunity for charging with solar at destination businesses (shopping centers, restaurants, and commercial parking ramps). The value to utilities and customers under both approaches is something our current project with NREL is working to understand more deeply. Each EV charger can charge a vehicle up to 7.7 kW. The actual level of power output varies between 0 percent, 25 percent, 50 percent, 75 percent, and 100 percent of this maximum, based on two factors. First, the state of charge of the EV’s battery drives a unique load pattern. Pictured below is a graph of the charging load profile for a Nissan Leaf when connected to a standard Level-2 charger. Notice that this load is not uniform across time while the vehicle is charging. 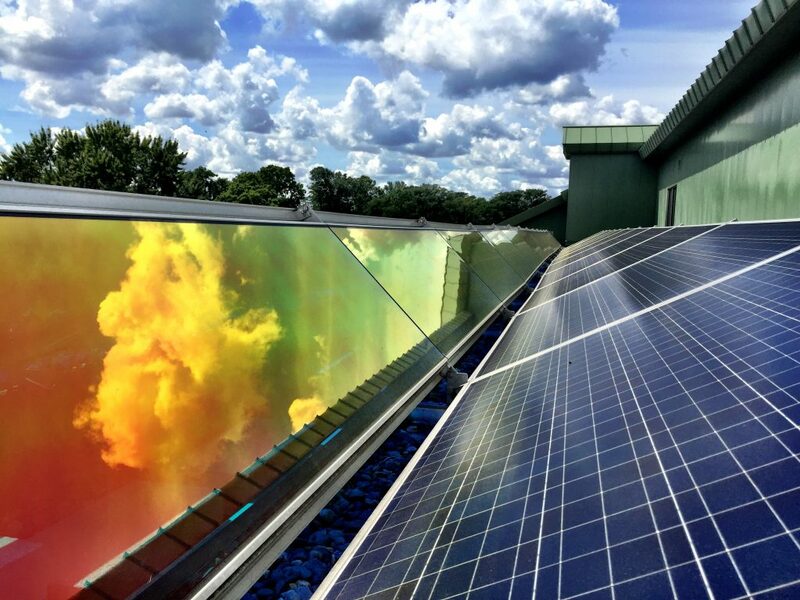 Second, a back-end coordinating system, ZEFNET, polls the solar installation of both the Greenway and Macalester arrays for their energy production every minute. ZEFNET varies the output level of the chargers with fluctuations of this combined PV output to maximize the amount of energy going into the vehicles from the solar generation. There are a variety of parameters this system can optimize. For example, the charger logic at the Greenway Building currently prioritizes on-site consumption of PV production, varying EV load to ensure that no solar PV flows back onto the distribution grid. 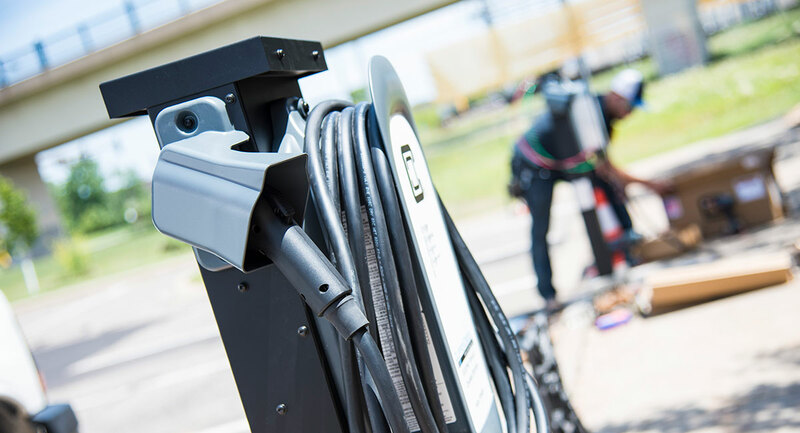 At the community scale, EV chargers can be optimized to help balance PV solar generation for an entire distribution circuit, instead of only a single on-site system. On a macro-scale, EV load could potentially be managed on a regional basis to assist in the integration of a large amount of renewable generation. The ability to maximize the benefits of this technology is not a given, and it depends largely on the availability of EVs plugged in with a need to charge in the right places at the right time. As EV deployment is still relatively low in the Midwest region, time is of the essence to unpack these dynamics so policies can be developed to deploy controlled charging technology and incent beneficial charging behavior. The system has been operating since mid-2017, with validated data coming in since the beginning of 2018. While this dataset is far from complete, we have already seen some interesting occurrences of the EV chargers managing multiple loads in a coordinated manner. 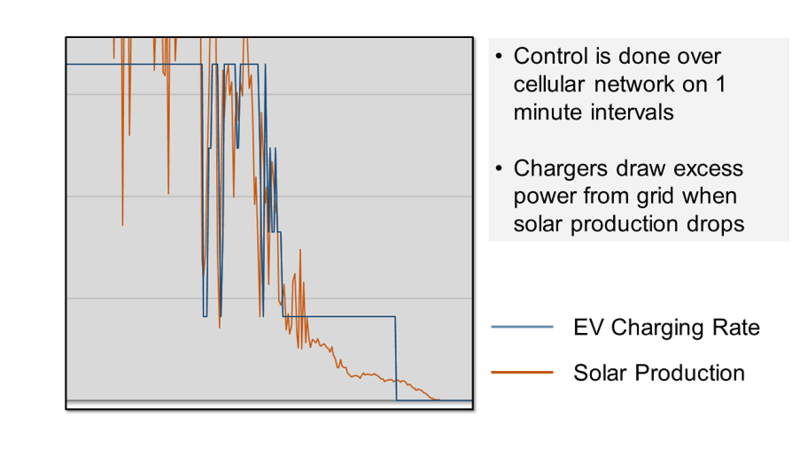 As shown in the figure below, the smart chargers can ramp the EV load up and down very quickly in response to solar PV generation fluctuations. This responsiveness could provide benefits to both electric grid operators and the electric customer who owns the charging stations. For customers, the application increases the amount of solar energy that is consumed behind the meter (where it is most valuable). For grid operators, the application can respond in real time to decrease demand on the electric grid from multiple EVs trying to charge at the same time when grid congestion is high. 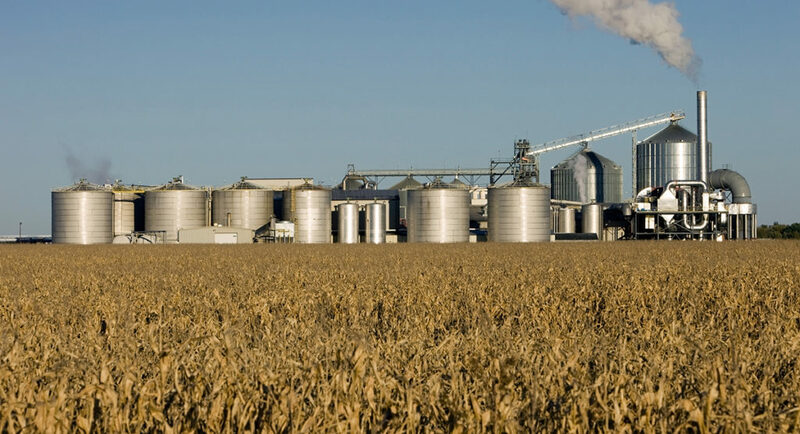 While the early results are encouraging, there is still plenty of work left to fully understand the value proposition of this innovative technology. A deeper understanding will help develop a deployment roadmap to maximize potential benefits to EV owners, owners of EV charging infrastructure, property owners with distributed solar energy systems, and electric grid managers. Over the coming year, we will continue to log data on our on-site EV charging and solar PV generation. 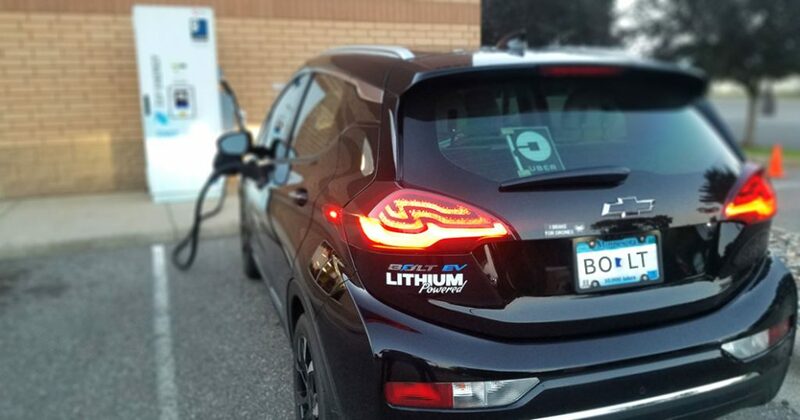 We will work to quantify when we typically see EVs plugged in, how much of their charging energy can be attributed to the solar arrays, and the emissions impacts of this type of smart charging relative to uncontrolled EV charging in Minnesota. As we gather data, we can modify the control system parameters and look at potential bill impacts such as how solar+EV affect demand charges that commercial building owners pay. We will also be working with national labs, including NREL and Lawrence Berkeley National Lab, using our experience and national data to model other use cases for the solar+EV applications. Stay tuned for periodic updates on our progress.